Flea anemia doesn't just mean your pet is low on iron. It's a serious condition in which fleas have drained so much blood that your pet's body is unable to function normally. It's especially common in very young and elderly animals who aren't strong enough to tolerate rapid blood loss. 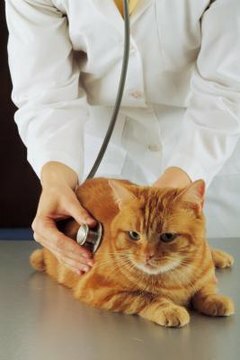 Flea anemia can be fatal, so treatment should be prompt. Your pet will need a combination of physical support, such as medication and blood transfusions, to combat the symptoms and flea treatment to eliminate the cause. Seek veterinary treatment for your pet if you suspect he has flea anemia. It can be fatal if not treated, and the sooner treatment begins the better chance your pet has for a full recovery. Treatments often include iron and vitamin supplements, medication, flea control and, in extreme cases, blood transfusion. Administer all medications and supplements as directed by your veterinarian. Pills can often be broken, crushed or mixed into food, or pushed into the center of a small treat. If your pet refuses medication and supplements, contact your vet for advice. Treatments may be available in a different form, such as a liquid or capsule, that is easier to administer. Treat your pet for fleas immediately, following the advice of your veterinarian. Flea baths and sprays kill adult fleas but don't stop eggs from developing, while pills and topical long-lasting drops can break the life cycle by killing adults, juveniles and eggs. Discuss options with your vet to make sure the side effects of any flea treatment will not interfere with your pet's recovery from anemia. The fleas must be controlled in order for your pet to get well, but his body may be too weak to tolerate some forms of control. Kill fleas on your pet's bedding and in your home using sprays and powders as recommended by your veterinarian. Wash bedding, blankets, rugs and any other pet items in hot water, and vacuum carpets thoroughly. Place your pet on a flea preventive treatment. These are often topical drops or oral pills that are administered monthly. Other options are available, however, and you should discuss the best options for your pet and his situation with your veterinarian. Preventing another flea infestation will keep your pet from fighting another bout of flea anemia.  Examine your pet regularly for signs of fleas even if he's not scratching himself, to make sure preventive treatments are working. ⚠ Don't wait to take a pet that has signs of serious flea anemia, or who is lethargic, has pale gums or is cool to the touch, to your veterinarian, since quick treatment could mean the difference between life and death.